VC International Pty Ltd (VCi) is a leading Australian manufacturer of medical alarm systems and community care products, designed to promote independence and peace of mind for people living alone or with a disability. VCi products allow people to remain safe and independent in their own homes for as long as possible, or in residential aged care, knowing that they can summon help in the event of an emergency. State and Federal Government agencies. 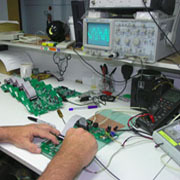 VCi products are made in Australia at our factory in Penrith, NSW. 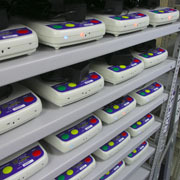 Each VCi product is individually tested and examined prior to leaving the factory. VCi pendant operated Personal Response Systems (Medical Alarms) protect and care for many tens of thousands of Australians from our large cities to the most remotest parts of Australia. VCi benefits from over 30 years experience providing easy to use technology to older and at risk Australians. NBN Ready. The VCi MK9s Medical Alarm can be connected to the UNI-V connection, or to the UNI-D connection using a service provider supplied ATA. Prior to entering into a service contract for the NBN, Medical Alarm customers should contact their alarm service provider for more information. 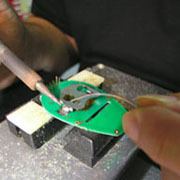 We work closely with our customers to fully meet their needs. Our Dialer can be supplied with a customer designed front panel label and the dialer personality is programmed to specific customer requirements. VCi has a long experience, (since 1983), providing technology for care delivery. VCi was formed in 1999 following the sale of the VitalCall business to Chubb Security. Unlike other companies, who import products in bulk and then find technical changes to stock difficult, VCi can make quick product changes to meet specific customer needs. Our facility is equipped with modern automated surface-mount assembly equipment, reflow ovens, ultrasonic welding machines and purpose built testing equipment.